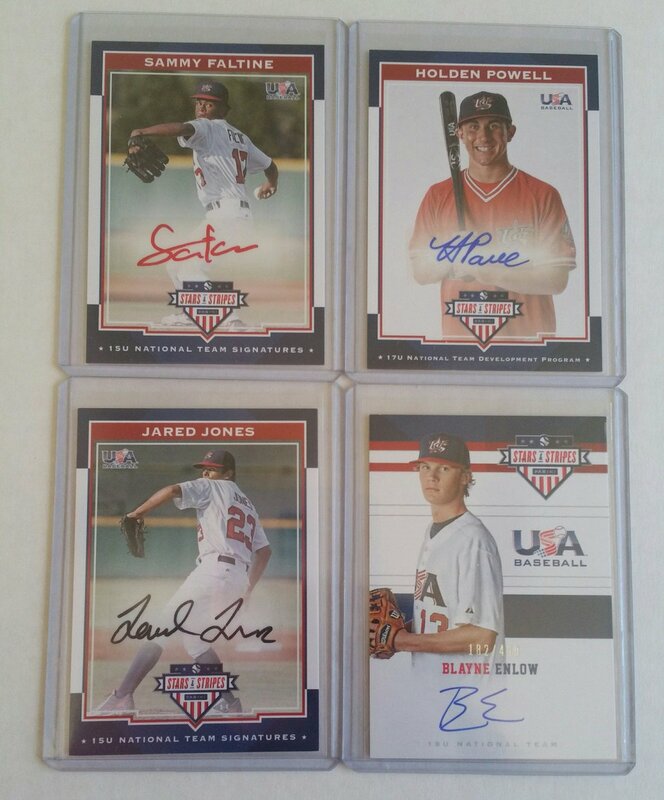 2017 Stars & Stripes and the MLB draft. Prior to my trip we broke a hobby box of 2017 Stars & Stripes and quickly posted the results on twitter. We beat the odds and got a hot box yielding eight auto/relic/combo cards instead of the five promised, which is always nice. But I wanted to take a quick second and break down the set now that the MLB draft has concluded. Not those Minnesota Twins – Twins. With the types of sets that include 15U, 18U, and college Team USA players, it’s sometimes hard to know which players ended up with the Twins. However with the draft having just concluded, we’ve only a few cards of players that are either still in high school/college or chose a university to attend in the fall. However, we did end up with one future Twin – third rounder, 76th overall Blayne Enlow. In both base form, and auto #/499! 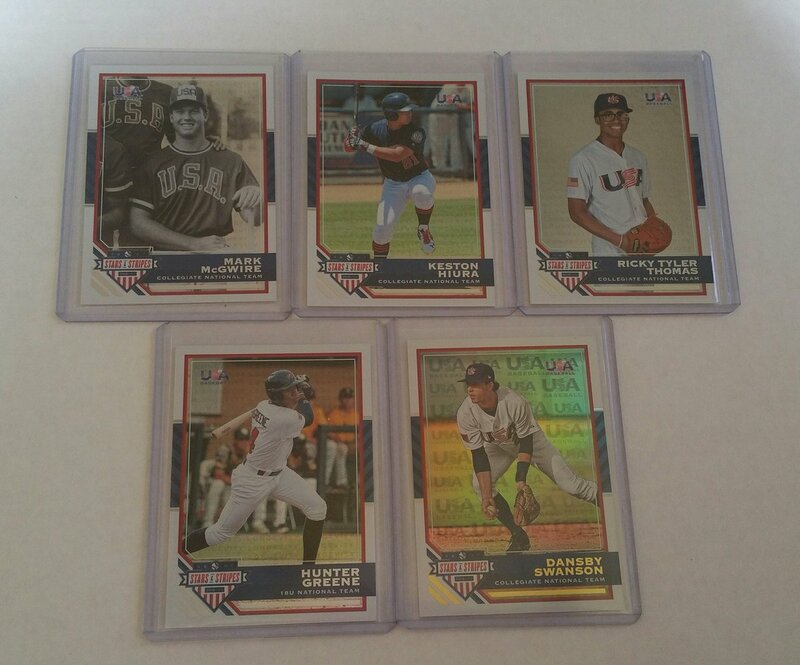 We only had two duplicates – sort of… – single base cards of top prospect Hunter Greene and Mark McGwire, and single base cards of their “Longevity” parallels. Ian Anderson – Braves – 2016 1st round, #3. Braxton Garrett – Marlins – 2016 1st round, #7. William Benson – Indians – 2016 1st round, #14. Matt Thaiss – Angels – 2016 1st round, #16. 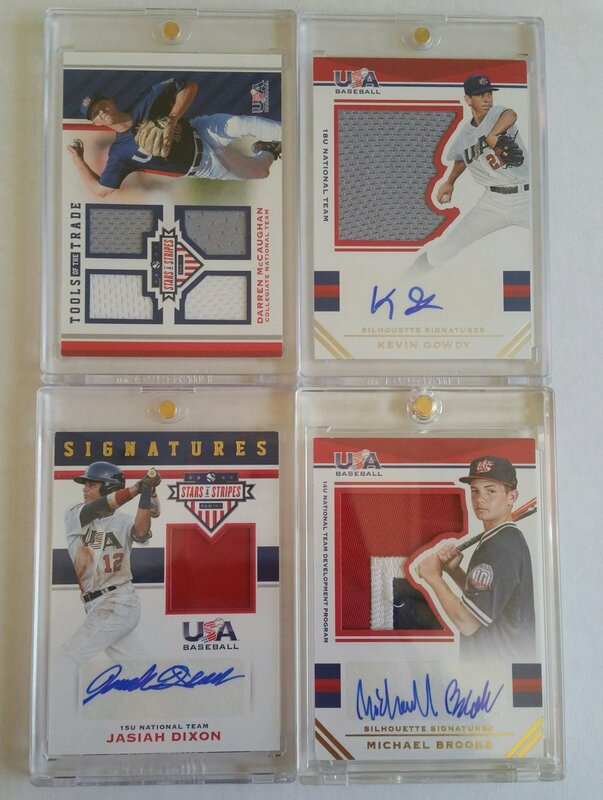 Zack Burdi – White Sox – 2016 1st round, #26. Robert Tyler – Rockies – 2016 1st round, #38. Anfernee Grier – Diamondbacks – 2016 1st round, #39. Logan Shore – Athletics – 2016 2nd round, #47. Buddy Reed – Padres – 2016 2nd round, #48. Cole Stobbe – Phillies – 2016 3rd round, #78. Bobby Dalbec – Red Sox – 2016 4th round, #118. Hunter Greene – Reds – 2017 1st round, #2. Brendan McKay – Rays – 2017 1st round, #4. Kyle Wright – Braves – 2017 1st round, #5. J.B. Bukauskas – Astros – 2017 1st round, #15. Tanner Houck – Red Sox – 2017 1st round, #24. Calvin Mitchell – Pirates – 2017 2nd round, #50. M.J. Melendez – Royals – 2017 2nd round, #52. We didn’t get many parallels, just four of the “Longevity” parallels mentioned above, and one low #/d card. Keston Hiura – Brewers – 2017 – 1st round, #9. Ricky Tyler Thomas – Cubs – 2017 7th round, #225. 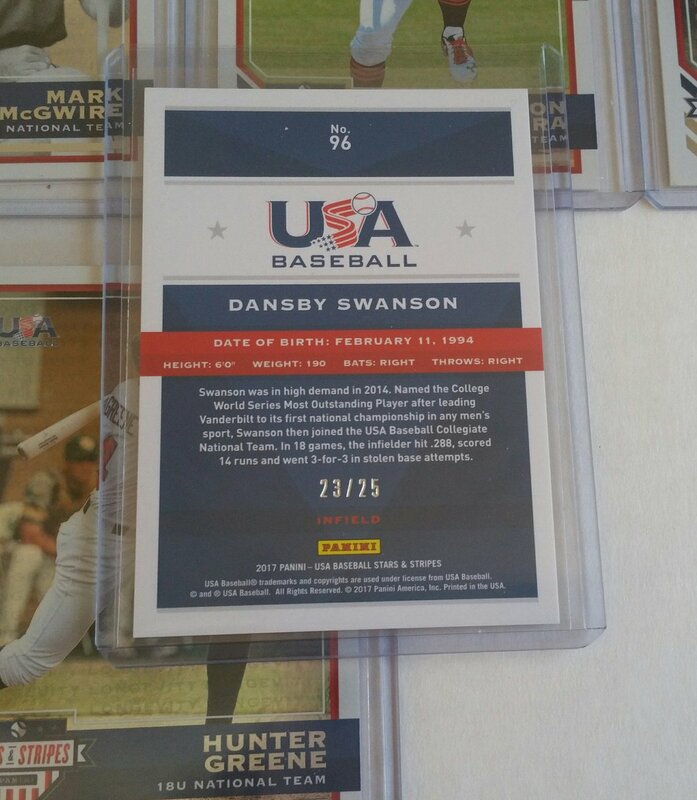 Dansby Swanson – Diamondbacks/Braves – 2015 1st, #1. #/d 23/25. Yeah, yeah, yeah, but what about the hits? – Hits, duh. Sammy Faltine isn’t eligible for the draft until 2019. #/d 7/10. Holden Powell wasn’t drafted and is committed to attending UCLA this fall. #/d 391/399. Jared Jones isn’t eligible for the draft until 2020. #/d 1/25. 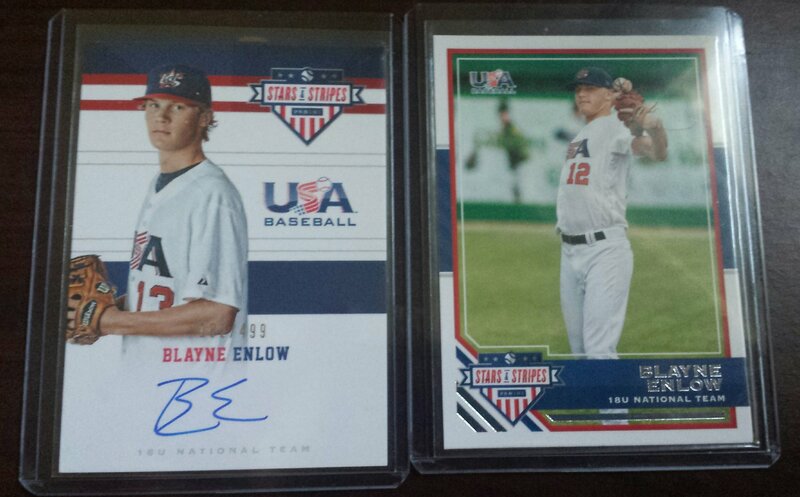 Blayne Enlow – Twins – 2017 3rd round, #76. :D. #/d 182/499. Darren McCaughan – Mariners – 2017 12th round, #363. #/d 160/199. Kevin Gowdy – Phillies – 2016 2nd round, #42. #/d 32/75. Jasiah Dixon isn’t eligible for the draft until 2019. #/d 14/25. Michael Brooks isn’t eligible for the draft until 2020. #/d 22/25. Strengths: Bonus hits, base set showcases newest draftees, patches not too dull, variety of #/d auto/relics, base design. Weaknesses: 14U/15U players heavily in the hits category, limited parallels(though the extra hits may have taken their place), only two Twins :D.